The criticisms of Russell are more or less summed up in this quote from CBS Sports' Will Brinson: "Russell doesn't exactly have a track record for being either fiscally responsible, good at football, or in shape." The bulky QB, who hasn't played a game of professional football in two years, sat down with Sports Illustrated's L. Jon Wertheim recently to tell his side of the story. "In the NFL, my first year, I had to be there at 6:30 before practice and be on the treadmill for an hour," he says. "Then meetings come, I sit down, eat my fruit. We watch film, and maybe I got tired. Coach Flip [quarterback coach John DeFilippo] pulled me aside and said, 'What are you doing for night life?' I said, 'Coach, I'm just chilling.' He said, 'I need to get you checked out.' I did the sleep test, and they said I had apnea." And what about that infamous purple drank incident? Russell was arrested in July, 2010 for possession of codeine - a controlled substance. Purple drank, or "syzzurp," is a popular narcotic cocktail in southern hip-hop circles. Russell admits in the interview that he failed a NFL drug test, but claims that he was taking the controlled substance to combat his sleep apnea. As he puts it, "I don't have a drug problem. "What I do have is police trailing every car I got like I'm some dope dealer." 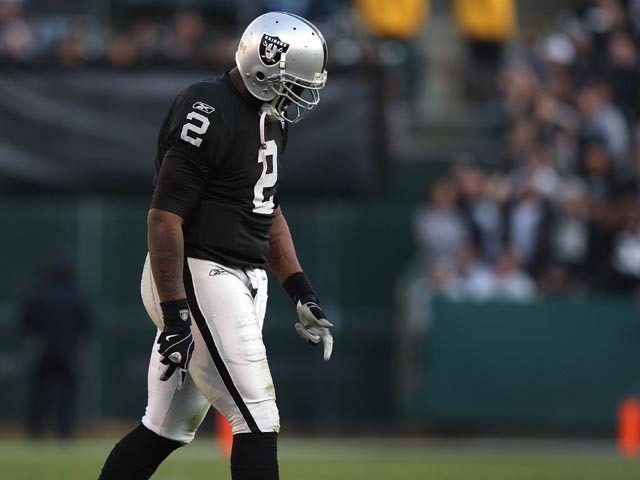 JaMarcus Russell is also not broke, he says. Reports from earlier in the Spring were that Russell's Oakland mansion was being foreclosed on. Russel claims he sold the house. "Football isn't paying me now," he says. "You make $1 million a game and you can do whatever. It's not like that anymore; I need to put myself in a place where those zeroes in the bank last for a long time. But I'm not broke. Far from it." So there you have it. Say what you will about JaMarcus Russell, at least he's still a millionaire. And he's not that fat.